15 February 1989 – The Soviet Union withdrew from Afghanistan after nine years of involvement in the civil war between rebel groups and the Soviet-backed Afghan government. Over 15,000 Soviet soldiers were killed in the fighting. 21 February 1972 - President Nixon arrived in China for meetings with Chairman Mao Tse-tung and Premier Chou En-lai. 21 February 1994 - CIA employee Aldrich Ames arrested on charges he spied for the Soviet Union from 1985 to 1991. The Secret Cold War Series continues with a fast-moving adventure in revolutionary Iran featuring Amado Ruiz and Jack Richards of the Raven-One Team. The Caspian Intercept is a follow-up to The Iranian Intercept. It may be read as a stand-alone novel and features a compelling cast of characters. Written in the third-person viewpoint, it combines historical events, intrigue, and high adventure into a fast-paced action thriller will have you burning through the pages. The Caspian Intercept will keep you guessing with unpredictable twists and turns. If you enjoy gripping thrillers loaded with suspense, action, and adventure, The Caspian Intercept is for you. When an Iranian technician reveals the existence of an unknown intercept tape, the Raven-One team is sent back to Tehran. But things are about to get worse, radicals take over the American embassy. A powerful enemy reemerges and seeks to stop the team in their tracks. Raven-One team operative Jack Richards is taken hostage and Amadeo Ruiz is forced to navigate through the chaos and barely escapes capture. Follow Amadeo as he flees through northern Iran with an enigmatic Italian woman. Who does she really work for? Azad Shirazi, consumed by an ominous sense of unease, examined the deserted operations center. Racks of electronic equipment glowed softly in near darkness. Days ago, Azad had a secure job and comfortable lifestyle. Working at the intelligence-gathering site instilled a sense of pride and patriotism. Now, the turbulent events of the past few weeks had turned his world upside down. Site T-1 offered an awe-inspiring view of the Caspian Sea. The facility, one of five ground stations of Project IBEX, a joint American-Iranian intelligence effort aimed at the Soviet Union. The primary mission was to intercept telemetry transmissions from missile launches at Tyuratam in Central Asia. From the first moments of launch to splashdown, the missile streamed a flood of vital telemetry data. Signal intercepts allowed analysts to measure Soviet missile performance and development. Azad, a slender man in his early thirties, hailed from the desert garden city of Shiraz, proud of his surname that echoed his heritage. He viewed himself as a perfect Persian, the inheritor of thousands of years of culture. He longed for his home city of Shiraz. The people on the Caspian coast spoke a different dialect and the region was far from his beloved Shiraz. A devout Muslim, he managed the temptations of the West and the strict code of his religion. His faith gave comfort and stability as he worked among strangers. It had been a satisfying job, defending his country against the godless Communists. They stood for everything evil in the world, until now. Three weeks before, the impossible happened. The Shah fled the country in the wake of escalating riots and protests. Azad had been sure the Americans would never let that happen. They did nothing. Two weeks later, American technicians abandoned the facility leaving the equipment running, intercepts sent to a satellite. Khomeini returned from exile and a few days later took over the government. Azad, ever faithful, stayed on the job, his skills needed to keep the facility running. Without doubt, the new regime would want to be on guard against the Russians. Five days ago, his worst fear came true. A delegation from the Committee of the Islamic Revolution showed up at the gate. The men were not Mazandarani from the local area, but an advance group from Tehran. They arrested the remaining local employees and took them away. Azad pleaded with the leader, a young Mullah wearing a green armband, to spare him. Azad insisted he was from the south, a real Persian, not one of the locals. He was an electrical engineering graduate, they needed him to maintain the equipment. It worked. The leader of the group ordered him to stay at the facility and keep it running. Guards posted outside the main gate had orders to allow no one in or out. A different faction returned the next day. They called themselves Basij-e Mostaz'afin, the Mobilization Resistance Force. A young Mullah led the group made up of rough characters, men from the street. Azad sensed danger. The Mullah, an intense man wearing wire-rimmed glasses, asked questions. "Why did you work for the American Satan? Why did you work for the Shah against the Iranian people?" Azad tried to explain: he was protecting the country against the godless Communists. He was a patriotic Iranian. They did not believe him. The interrogation began. Azad told them what they wanted to hear, but to no avail. A large angry man administered a professional beating. Azad, at the edge of consciousness pleaded, told them he was a good Muslim and prayed five times a day. He worked for the Americans only to spy on them. They demanded proof he was spying on the American Satan. Desperate, he told how the Americans sent their data back to the den of spies in Washington. The data transmitted to a satellite in space and beamed back to the United States for analysis. They drug him outside. He pointed out the satellite dish. A volley of bullets destroyed the last means of communication. In the end, his job saved his life. They needed his unique skills to maintain the facility until the new regime decided what to do. The Mullah instructed Azad to stay and keep the equipment running. He did not tell them the automated collection system continued to run. Tapes collected intercepts, but no longer transmitted data. Trapped, his future uncertain, Azad kept his established routine. Check the electrical circuits every two hours. Start the emergency generator daily. Wait for the unknown. It had been three days since they left, but he realized they would return. In his heart, he knew he was expendable. He sank into a chair in the operations center, desperate for an idea. Anything that would save him from an uncertain fate. Startled when a tape machine began recording, Azad eased over to the bank of equipment. He placed a hand on the lever intent on halting the process, hesitated for a moment, and looked back at the intercept operator's console. Although not a trained operator, he had seen the Americans in action. The panoramic display flashed with the unmistakable signature of a Soviet missile launch. He knew that much for sure. Antennas focused on targets in Turkmenistan across the Caspian Sea monitored Soviet missile telemetry. His hand released the lever and hurried back to the console. For a full five minutes, he stared at the display, pausing only to look back at the revolving tape reel. The germ of an idea began to form. The Americans always celebrated a successful intercept. It was an important occasion. This was a test they would never know about, unless Azad took the tape. THE CASPIAN INTERCEPT: A RAVEN-ONE TEAM THRILLER transports you to the secret front line of the Cold War. A Full-length novel |Book Four in The Secret Cold War Series. 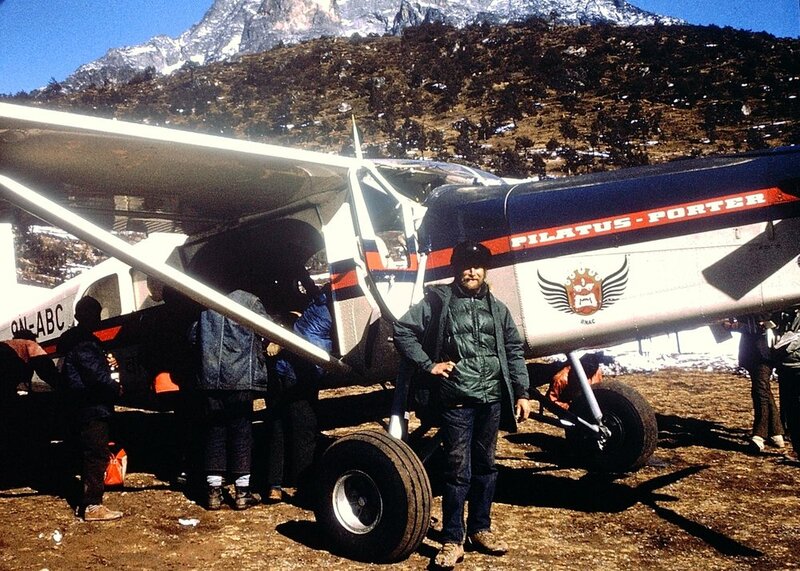 January 1974: All flights from Lukla had been canceled because of the oil crisis. That meant we had no way to get back to Kathmandu, except to walk out. We couldn’t go back the way we came in because the passes might be snowed in by the time we get there. The only other way to walk out is to go south down the Dudh Kosi river valley, a very long trip. Our only other option is to try to fly out of Sangpoche airport at the Everest View Hotel. We headed down the valley and went straight to the Hotel to book a flight out. We were put on the waiting list and had hot chocolate at the hotel. Then we trekked back down the hill to the International Footrest Hotel in to wait. We expected to wait several days for a flight out. The hotel had a daily flight to bring in supplies and to fly out laundry. The situation was also complicated because three of the four pilots that are qualified to land at Sangpoche had quit. It snowed the day of our flight and we were delayed for two days until they cleared off the runway. The legendary Swiss pilot Captain Emil Wick piloted the single-engine Pilatus Porter. He was probably the greatest living mountain pilot. He was known for his outrageous sense of humor and had flown climbers into remote mountain airstrips in Nepal. He had the distinction of being one of only two people to descend an 8000-meter peak without climbing it. This was after he crashed a Porter while delivering supplies to a Dhaulagiri expedition in 1960. The Pilatus Porter is Swiss made and powered by a single turboprop engine. It was built for landing on glaciers in the Alps. It is much praised for its excellent handling and short take-off and landing capabilities that made it ideal for mountain flying. 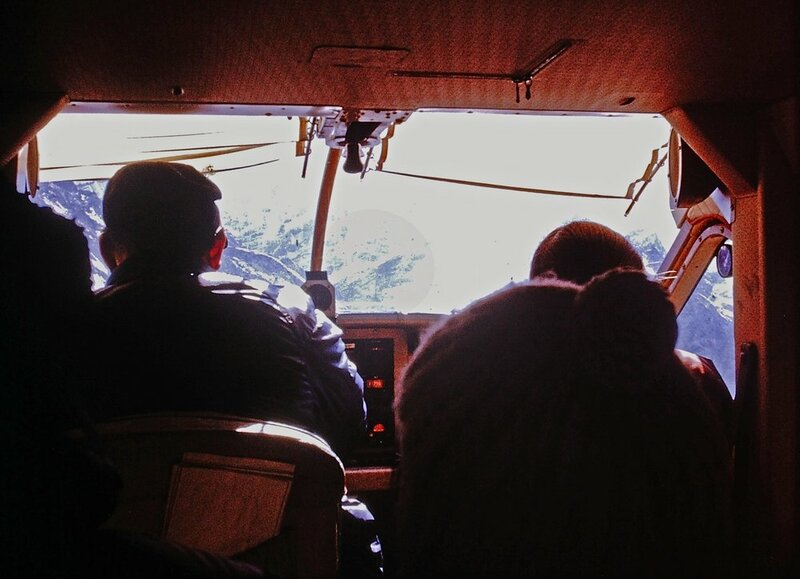 At Sangpoche airport, about 11,400 feet in altitude, one must make a landing and take-off in less than 1,000 feet. At the uphill end of the runway is a cliff and at the downhill end of the runway is a 1,500-foot drop down into the valley. As we are loading up Captain Emil told us about some of his strangest flights. One time he had to fly a Yak out. It took up all of the spare room. Another time he flew out a leopard that was headed to a zoo in Japan. He said the leopard started growling so he gained altitude till it went to sleep in the thin air. Our gear was weighed and carefully loaded the plane because weight is critical at this altitude. We took off down the runway, going airborne about halfway. At the end of the runway he banked right and we were on our way for a spectacular trip back to Kathmandu. 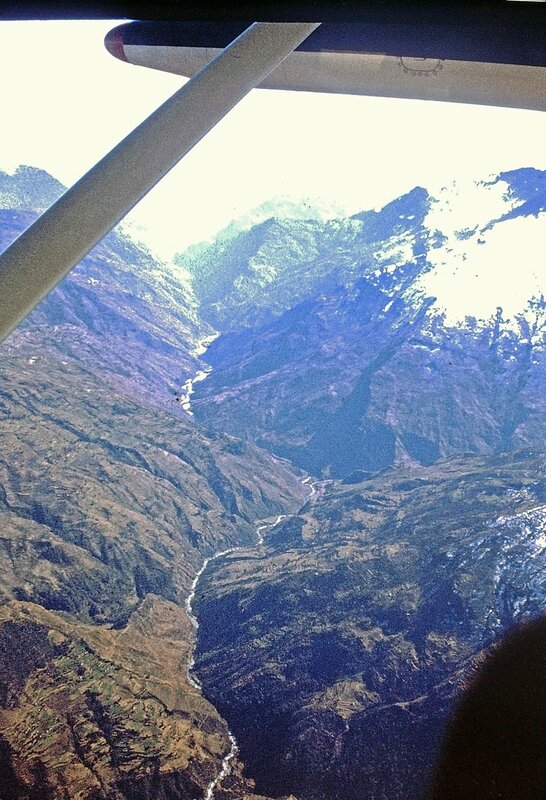 Flying in the Himalayas is a fusion of wonder and fear. The awe-inspiring panorama of the high mountains acts as a powerful drug subduing the senses, blocking out the inescapable reality that death awaits those who linger in its spell. The hypnotic trance may lure the unsuspecting to the side of a cliff. Engine failure results in a harrowing decent to the rocks below. Wind shear, an invisible, unexpected, and deadly force, might at any moment, plunge the frail craft into the void. Following the valley of the Dudh Kosi River, as it closed in narrower and narrower, was akin to flying into the jaws of a mythical monster, the jagged mountains forming its teeth. The small aircraft continued on its way skirting rough walls, pummeled by bursts of turbulence, straining to maintain its course. I searched the valley walls for our destination. No one spoke. The furious roar of the propeller and the low rumble of the slipstream rushed past the cockpit. The pilot broke an awkward silence, "Can you see it?" I pressed forward in the harness, straining to find it. "No, just the mountains." He pointed. "There at one o'clock, past the village, up the side valley. Namche Bazaar." "All I see is a small brown spot." Ahead, a gash on the side of the ridge appeared about three kilometers away. A twinge of anxiety welled up as I awaited the approach and landing on such a tiny speck. Further up the valley, low cloud cover was beginning to form, merging the valley with the white slopes of the mountains. I was about to seek reassurance from the pilot when the brawny man behind me leaned forward and spoke to the pilot. "Es ist so klein." I could smell his fear. He asked if it was safe. "Ist es sicher?" The pilot answered, "Ja Ja, kein Problem." He asked the man if he was okay. "Ist alles in Ordnung?" "Machen Sie sich keine Sorgen." He told him not to worry. He brusquely told him, "Bitte nicht erbrechen," not to throw-up. "Hörst du mich — nicht erbrechen." The pilot leaned towards me. "These guys from the east are not so tough. He says he is sick." "The east, what do you mean?" "One of the eastern lands. Can tell from his accent." That simple comment should have set off alarm bells, but the enormity of the spectacle before me short-circuited my internal warning system. He banked right and changed course up the new valley. Ahead, at 12,500 feet, lay the world's highest airport. Syangboche airstrip, less than 400 yards in length perched on a ledge 1,500 feet above the river below. It would be like landing on an aircraft carrier. The pilot, a confident and cheerful Swiss, a legendary mountain flyer, tracked the edge of the cliff to our right as he fought the turbulence. "The clouds are closing in. I must take off again as soon as we load up. Hope the bastards are ready for me. I do not stay for long." The small plane trembled as turbulent air threatened to drive it into the rugged cliff looming above. The single engine Pilatus Porter banked to the left to begin the final approach. A fierce gust shook the small craft causing it to slide away from the postage stamp sized landing strip. We drifted straight towards a rocky ridge. He dipped the nose, eased the throttle forward, gained speed, tracked right, and then left again. The aircraft was back on course. We would land on an up-hill grade that ended at a jumble of rocks below a small cliff. Another wind shear shook the craft as he eased the throttle back to idle, deployed the large flaps, and brought the nose up for landing. The aircraft shuddered as it decelerated below forty-five knots and gently touched down with a slight thud. With full brakes and reverse thrust, the Porter achieved a remarkably short rollout after landing, with plenty room to spare. The brawny man let out an audible sigh of relief.